Illness, loss, hardship, grief, death... all these unthinkable assaults on the spirit are the very real trials each of us is called on by life to try to endure, to understand and to move beyond without embitterment. It’s a very tall order. Most of us turn to God for solace... but sometimes, when hard-pressed, we don’t just ask for help... instead, we rail or demand answers. Sometimes we cry or beg or plead, or simply sob out our frustrations in desperate human words, and then feel guilty about having been so bold. We’ve been taught by churches that formality equals reverence, but Cathy Cash Spellman came to believe quite the opposite is true. Nobody rails at God without believing with absolute certainty that S/He is there and listening. 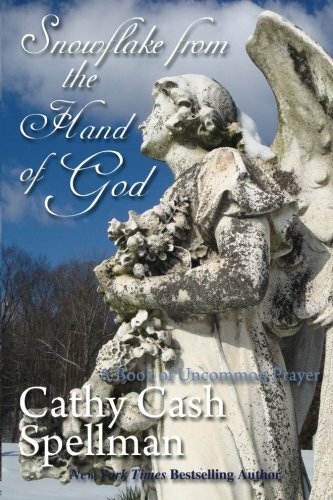 Cathy had begun to write about the anguish of terrible loss after her very unexpected divorce and the death of her father... but as her daughter Cee Cee faced terminal illness, and began to ask her mother to write about what you really long to say in prayer when you are in desperate straits, this moving little book grew to be both an outcry to the heart of God, and a profound Act of Faith and Love. Written as prose and poetry, Snowflake from the Hand of God is a book of uncommon prayer, offered in the hope it might help others who are being sorely tested by illness, divorce, loss, death or any other assault on the spirit, find their way on the rockiest parts of life’s road.